The more I looked at the scroll detail that I designed the less I liked it. It’s still a viable pattern, but I don’t feel that it reflects the overall aesthetic that I’m going for. It has more of a country craft feel to it instead of the intended asian nuance. The arcs are too bold. Fast I think is the correct terminology. The entire pattern needs to be “slowed” and made to be more subtle. Especially for what I have in mind to do with this detail. But you’ll have to wait to find out what that it is. So I went back to the drawing board. Still working within the same module and played with the proportions until I had the scroll to my liking and closer to the detail on the original inspiration piece. Here are how the proportions work out. One thing to note about the original scroll design. This box, built with the original scroll design, a coat of paint and the right hardware, would look at home in a country cottage setting. Actually, this design is turning out to quite versatile. It’s not overtly Japanese/Asian looking, but can be made to be so. The interior can be configured in a multitude of ways and its scalable. In fact, I think it would retain its functionality even at half the current size that I’m building. I have managed to get in a little shop time after work this week. Not a great deal of progress to report, but progress just the same. 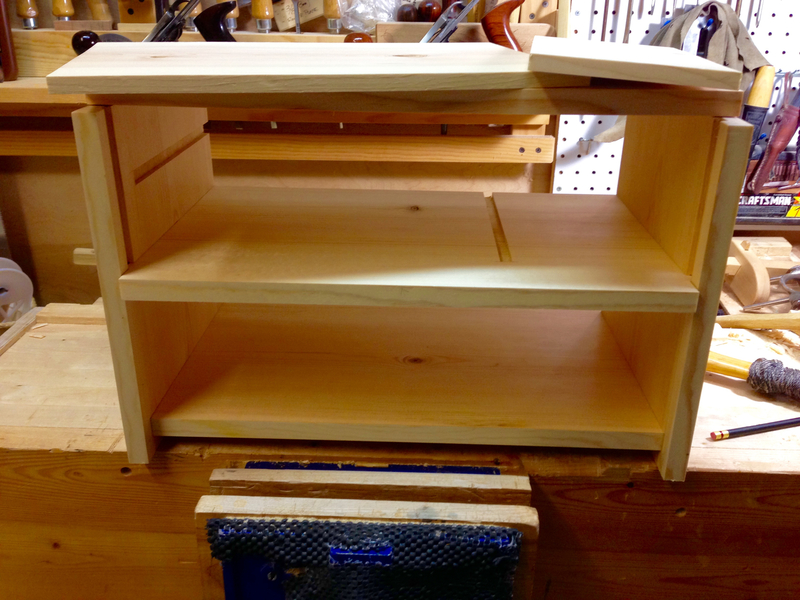 The center divider shelf is fitted. Although it still needs its front edge trimmed. 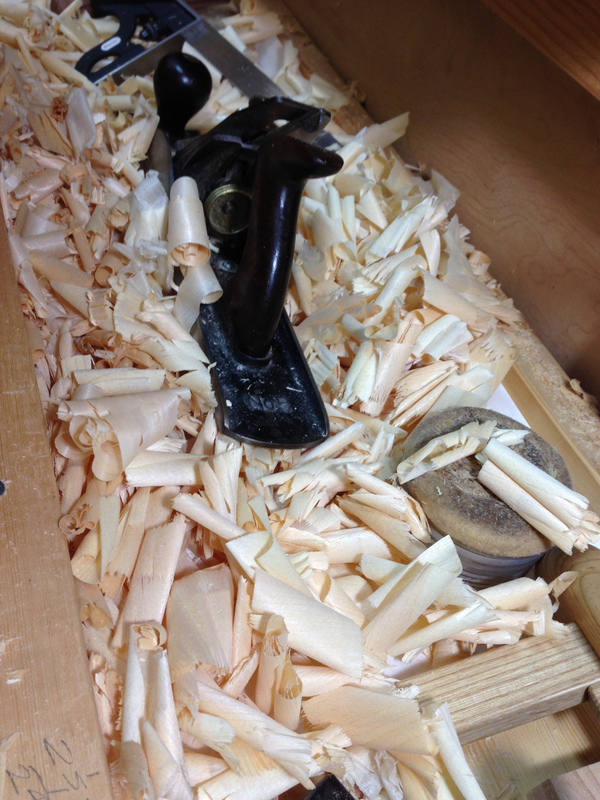 The other small bit of progress was to thickness a couple of pieces down to 1/2″(I have the shavings to prove it). These pieces will be used to construct the interior dividers. That’s the sum total of forward progress this week. Like I said, not much, but progress just the same. 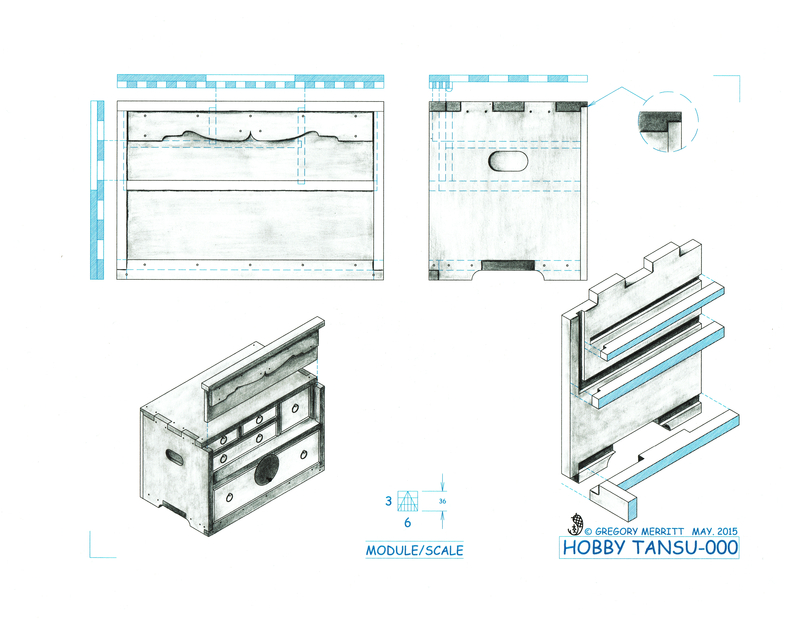 This entry was posted in Hillbilly Hobby Tansu-000 and tagged Design, Hillbilly Tansu Project, Illustrating. Bookmark the permalink. It’s fun watching this project take shape. Now, about that scroll. Yes, you “slowed” it, but it’s not quite there yet. The problem is that your most excellent drafting skills are getting in the way. That’s most obvious where the small central curve is joined by the longest curve. There, a small fixed radius meets a much larger radius with little transition. Decorative scolls all go back to the classic acanthus plant. Having drawn literally hundreds of acanthus scrolls, and having carved a few, I can tell you the ones that look best have absolutely no fixed radii … anywhere. The curves are completely organic. Think of constructing spirals. Then think of connecting a small tight one with a larger one. The connection will be a long shallow “S,”tighter at one end than the other. Changing tha one area will make an amazing difference. Keep havin’ fun. That’s going to be a very handy tansu. Dang it Bob!….your correct of course. 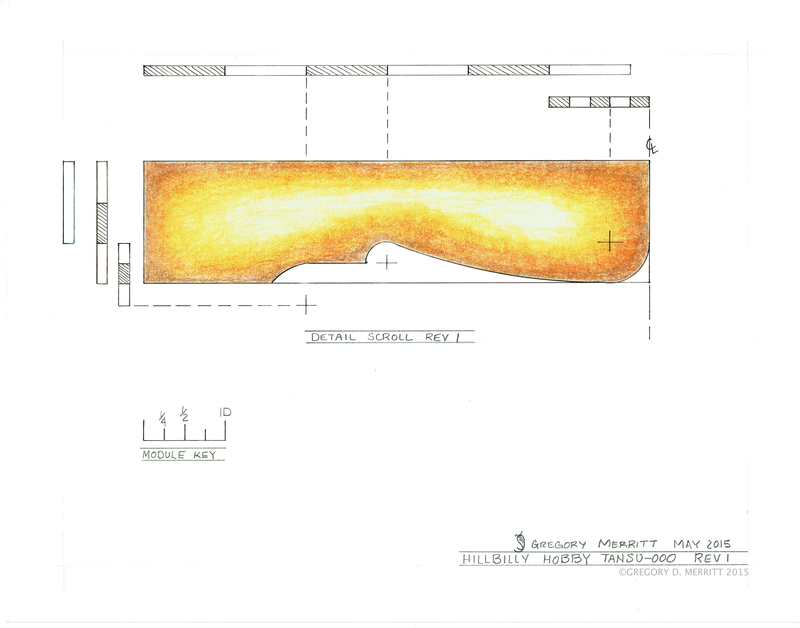 Not so much about my drafting skills but the organic nature of the scroll. I’ll go back to the drawing board tonight and create grid. Then freehand sketch the detail until I have it looking less rigid and more organic. I’ll not be throwing away my compass however. That’s a step to far sir. It is interesting that the overall look of this piece hinges on this one detail. Just by altering this simple applique piece the entire assembly can be made to look like many different styles. No decorative cut, mid-century modern. A geometric block pattern, south western. Flamboyant and carved scroll, French. I agree. The first version looked a little country craft. This is an improvement. My two cents…a Greene and Greene style cloud lift would look great and accentuate the Asian aesthetic you already have going. I’m sure however you decide to do it, it will look good. Thanks Adam. I’m just feeling my way. Thanks for the Greene and Greene suggestion, I’ll play around with a few sketches.